Set Items comprise Item Sets. In Diablo III these are not a separate type of item, but function basically as groups of Legendary items that grant additional bonuses when equipped at the same time. Set Items are primarily end game gear, and while the properties of any individual set item might not be that great, they can be quite powerful when used in pairs or groups, when the partial set bonuses are included. All Set Items that can be found exist only in Inferno, with a level 60 requirement to equip. Other Set Items can only be created via crafting with the Blacksmith, and those range widely in their level requirement and stats. Diablo II featured item sets as well. See the D2 Item Set information for details. A list of every item set in Diablo III, including the individual items in that set and the partial set bonuses. Click to the set articles to see all the items and bonuses in each set. 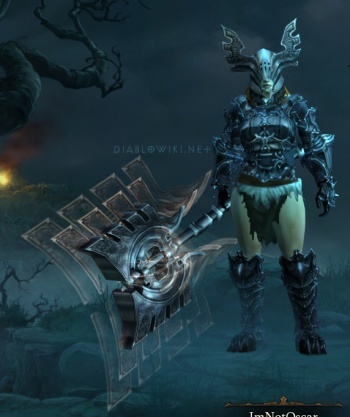 Most of the Item Sets in Diablo III grant a special appearance to the character wearing them. A few of the individual items do this, but full sets do it more visibly, with graphics or special functions only granted by that set. Individual set items often have unchanged graphics, but offer new colors and other visual effects. All classes wearing a full set of identical items. Barbarian wearing Immortal King, full set. It's looking more and more likely that set items will simply be something you chase in the end-game. And realistically that's really where they simply work the best. We have a few ideas still that could allow them to be available while leveling, but each of them have sticking points that would require their own solutions. One is expanding sets out so that it isn't just one item in each slot, but a group of items all separated by level requirement. So there could be, say, five pairs of pants that all work as part of the set and are each better than the last. While leveling you could be wearing the first pair of pants and then find a new and better pair that still work to benefit your set bonus. That isn't without its problems though. We of course like and intend to keep partial set bonuses, by the way. Anyway, sets are actually in the game right now in very limited forms, there's a bit of design left on them yet, but as I said they work very well at end-game and that's where we're leaning toward them appearing. Bashiok added an update six months later, in April 2011. No set item parts/pieces? Or to clarify, will set pieces only be useful if the whole set is completed? Bashiok: Set items are now legendaries defined by a set bonus. They’re crafted items while leveling (recipes can be found that grant the ability to craft all the items in a set), which allows someone to really invest in filling out a set before they out-level it. Then at max level we’ll drop set pieces normally. Leveling up you will find recipes that will enable you to make a set. Every item in that set will be in the recipe list, enabling you to craft the set one piece at a time. When you hit max level, you will find the actual set pieces, not the recipes for the complete sets… That’s how I understood it. Bashiok: Yeah, that’s it. Although recipes aren’t planned to actually stop dropping. You’ll just also have the items themselves drop in addition. Item Sets and Set Items were a nifty idea in Diablo II, but the execution was not perfect, especially in D2C, where Item Sets were generally underpowered and not worth wearing. There were no partial set bonuses in D2C; a character had to wear the entire set to receive any bonuses, and these bonuses were generally quite small. D2X introduced much higher quality item sets, including ones comprised entirely of exceptional or elite items, some of which were comparable to the best Rare or Unique items. D2X also incorporated a variety of partial set bonuses, where characters drew extra bonuses for wearing two or more items of a set. '''Jay Wilson:''' There're still a few things that we haven't made decisions on yet -- set items, for one. I didn't like the way they worked in Diablo 2, as by the time you finally got a set together, you generally leveled beyond the use for it. So you might save them for alts, which is OK, but I'd rather that they be useful for you to begin with. We haven't really decided how we're going to fix that. This page was last edited on 5 June 2014, at 22:27.